This particular weekend seems to be one of the most interesting from a culinary perspective. There's loads to keep us occupied that you don't really need to go watch Inception (for the second time!). So toast to the good life with a little bubbly or get down and dirty with some kitchen action by chefs from all over the world. An incentive to crawl out from bed before lunch time, the Prego's bubbly brunch just got even better as they have now started serving GH Mumm champagne. I must admit that I've not had the chance to sample the brunch (probably because I'm not an early riser) but I do vaguely remember trying Prego's brunch eons ago when there was a Westin hotel in Singapore. A recent trip to Prego to sample some of the new goodies left me incredibly satisfied. 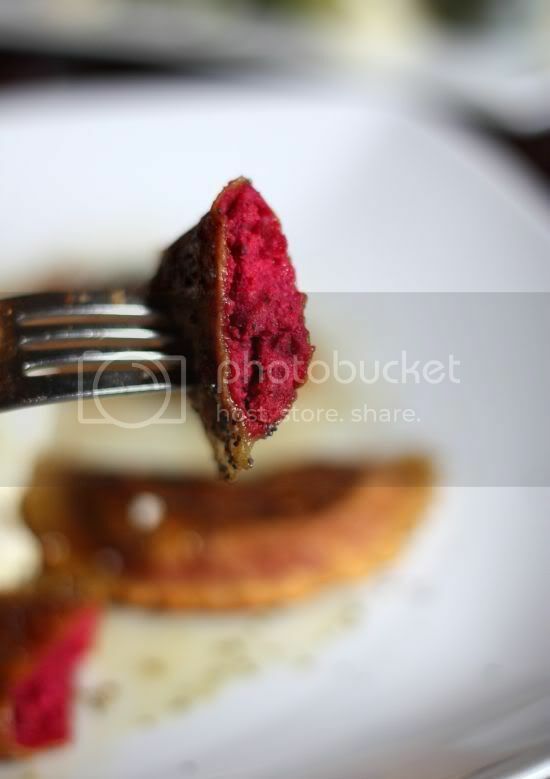 I was blown away by the lovely looking (and tasting) beetroot ravioli and the supremely divine roasted figs with cheese. These two dishes literally had me salivating for more. Hopefully all these items make it to the Sunday menu as they're so gorgeous that they should be highlighted. *Post note: A little bird just sent me more information on the brunch - simply mouthwatering: there's a cheeseboard to make any Italian happy, free flow vodka (Smirnoff, Skyy & Grey Goose) and Italian prosecco, if you wish to be loyal. Personally I prefer champagne paired with the Irish oysters served there. Star Clove has organised a series of events to celebrate all things female this weekend. While the idea of a Misteria Lane with fortune tellers to predict your shaky future sound very interesting, I'm sure you, dear blog reader is more interested in the culinary part. There's going to be free cooking demonstrations throughout the three days at Caffe La Femme, Hall 5, KL Convention Centre. Kicking off tomorrow's demonstration is Chef Matsubara from the Loaf, then the next day you can catch Amy Beh, Debbie Teoh and Edwin Yau from Daikanyama, one of my favourite Japanese late night hangout places. On Sunday, there'll be more classes by Amy Beh and Debbie Teoh. More information in the Femmecity website. The World Golden Chef Competition and Expo, MIECC, Mines, Seri Kembangan. Who needs Iron Chef on AFC when the real thing is happening at our doorstep? Here's your chance to catch some kitchen olympics as 55 teams from all over the world vie for the title of World Golden Chef. Particpants such as United States, Netherlands, Spain, Germany, Korea, China, Taiwan, Singapore, Australia and Hong Kong are confirmed attending. The teams of four will prepare six dishes including dessert and four types of hot dishes. During the event, there will also be culinary demonstrations by local chefs, acrobatic performances, cutting-noodle on stilts stunts while spinning hula-hoops, a lion dance performance and kung fu-tea-pouring competition. Admission is free. First 100 visitors will get a trolley worth RM60. Call 03-8024 6500 or 3-2144 8791 for enquiries. Curveballs...don't you think life often throws us weird situations that we just have to make the best out of it? Our visit to this place was one big curve ball since the visit was prompted by the pursuit for Johor food but instead we discovered amazing rice dishes. C'est la vie! 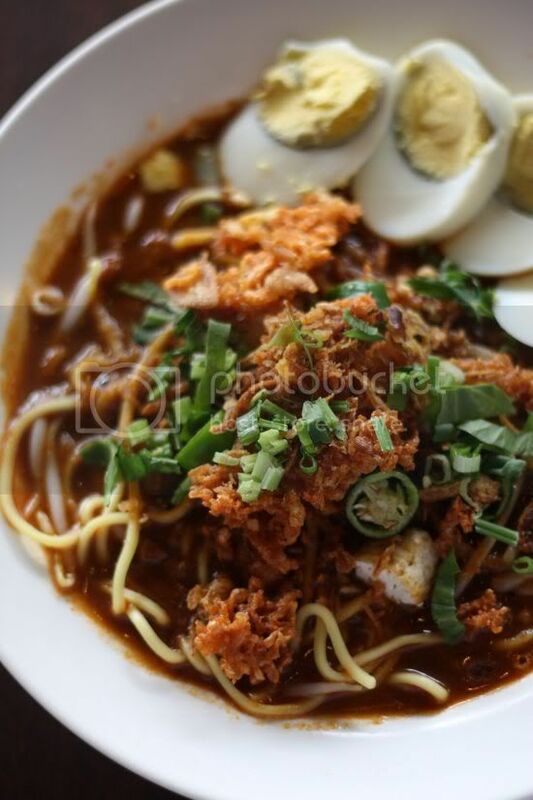 I was recently asked where do you get great Johor laksa? You could hear silence on my end when that request came through. I could feel the brain cells processing its internal search system and coming up with no results. Oops! Internal error? Nope, it ain't no error as honestly, my exposure to Johor laksa has been pretty bad since the great ones I have tasted have only been the homecooked varieties. D'Cengkih has always been on my horizon, probably because we do a compulsory weekly visit to Taman Tun Dr Ismail to stock up pet supplies (yup, kitties don't just cat nap all the time, they also eat the house down!). One weekend, I finally made it here as like my friend M pointed out to me, this place is supposedly famous for its Johor food. A word of warning though about dining here - bring your earplugs if you love your peace and quiet when you're chewing your food - live music sessions go on within the narrow confines of the restaurant - thwang goes the guitar!! I honestly don't mind having an old tune (no Lady Gaga or Keisha ok?) to hum to when I'm chowing down but not when the acoustics bounce around so much that I can't carry a conversation with my friend about the merits of their food. On to the food, apologies for taking so long to reach that point since it has been spiel for the past paragraphs. 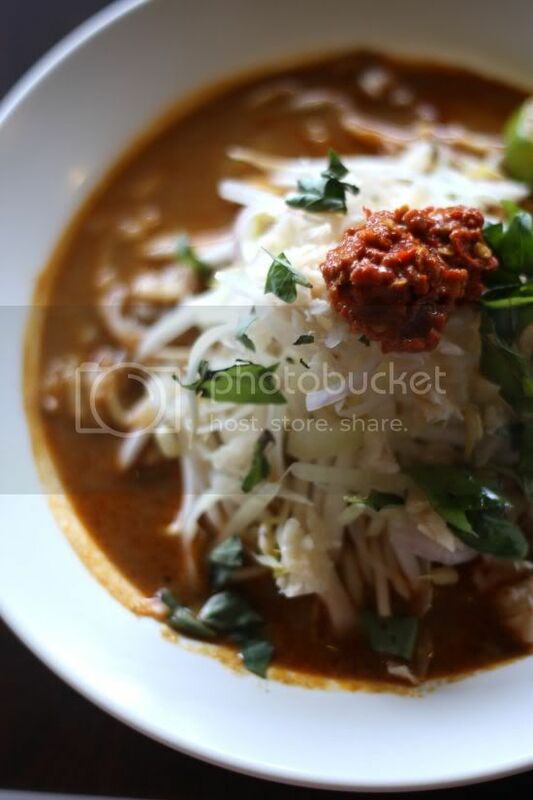 During the weekends, Johor laksa can be found here, which we promptly ordered. When they plonked the bowl down, it looked promising with the thick sauce, a dollop of sambal, a mountain of vegetables and the pre-requisite spaghetti strands. A spoonful of the laksa though revealed it was just an illusion as it way too sweet. Was my sweet ice tea corrupting my tastebuds? I took another spoonful and yup, it was too darn sweet despite it being thick (a plus point) even though it didn't have enough shredded fish. The next dish we tried was the mee rebus. I braced myself for the sweet attack and yes, there it was mingling among the thick broth garnished with crunchy fried shallots, sliced hard boil egg and crumbled crunchy prawn crackers. Hold on, something is not right, my brain was screaming to me. Isn't this place packed with people? They must be here for the spread (all laid out at the back for you to pick and choose) since I don't think they're here for the music? 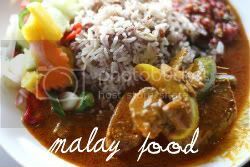 A glance around the tables revealed rice dishes and nasi dagang that looked foreign here since they claim to be specialising in southern food versus the northern fare. Never mind we thought, throwing caution to the wind (or more the tummy) and M went to get a plate of the reddish brown and white rice. Visually it was promising with the pre-requisites of an excellent nasi dagang: halba or fenugreek seeds, finely sliced ginger and shallots, and each grain seperate, not mushy with a sheen only obtained from coconut milk. One taste and bingo! we confirmed that we were in the presence of greatness - amazingly good and authentic nasi dagang. Served with a fruit and vegetable acar and ikan tongkol (tuna curry) this was heavenly stuff that I could eat all day. M's friend had also pre-warned her about the nasi lemak. We expected it to be served in a plate but instead it came in a humble little brown packet. 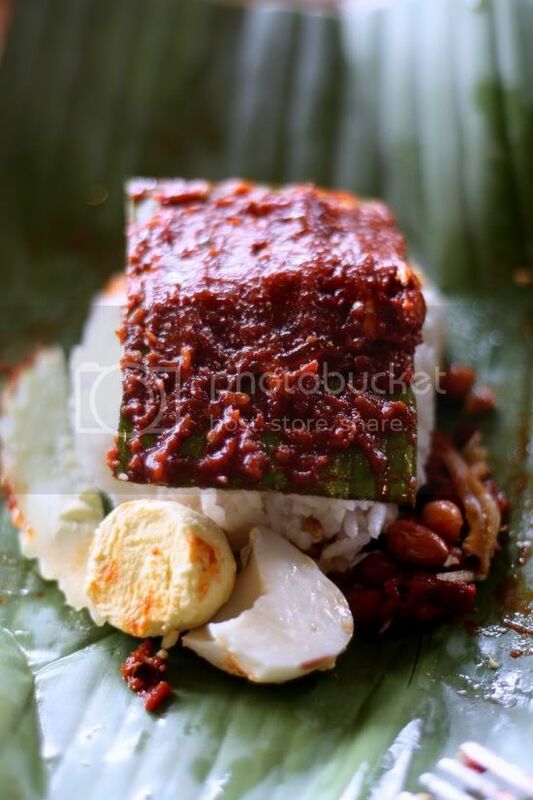 Opening it, we discovered sambal slathered on a piece of banana leaf. 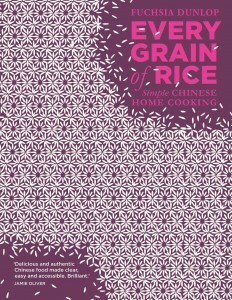 Pushing that aside, we discovered the RICE. Looking a little compressed from the packing, a mouthful revealed a rich coconut milk taste and a hint from the fenugreek seeds - simply gorgeous. The sambal that was vying for our attention was also a little too sweet but decent tasting. Conclusion of the day: zoom in on the rice dishes since they seem to excel in those versus the noodles unless you have a very higher tolerance for sugar. I reckon I'll be back for more especially their fascinating array of dishes at the back. Maybe the briyani rice since its also a weekend special or nasi ambang that is served daily. A series of mishaps led us here one weekend. While the place is damn hard to find (my friends got so lost since there are non existence signs from the carpark), the food is totally worth the trouble it takes. Must admit that its simply brilliant that they do a monthly menu as it entices one to keep visiting to sample all their fare. One wonders if they'll repeat the menus again, since there's only so many recipes she has in her cookbook. One tip for ordering - if you're not too sure what it'll look like, just sneak a peek into her cookbook available at the front and you can find visual indications there. It was a late lunch of brilliant choices (only one failed so 9 out of 10), which is pretty great I reckon! 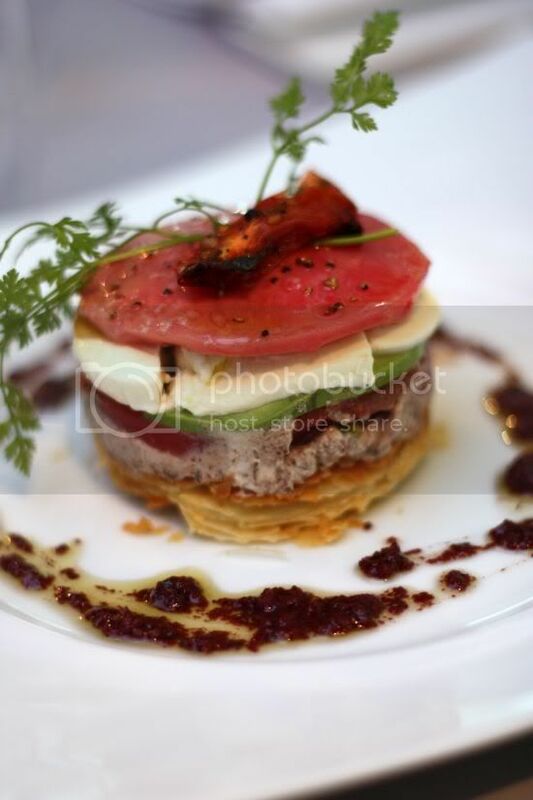 The tuna mille feuille was simply divine - the black olives tapenade on the side seemed to lift the gentle flavours of the tuna, tomato, mozzarella and flaky pastry into something so heavenly that my tastebuds were salivating from that one mouthful. Drats! I wish I had ordered that instead. My Norwegian poached egg was only slightly less desirable I reckon (I console myself!) 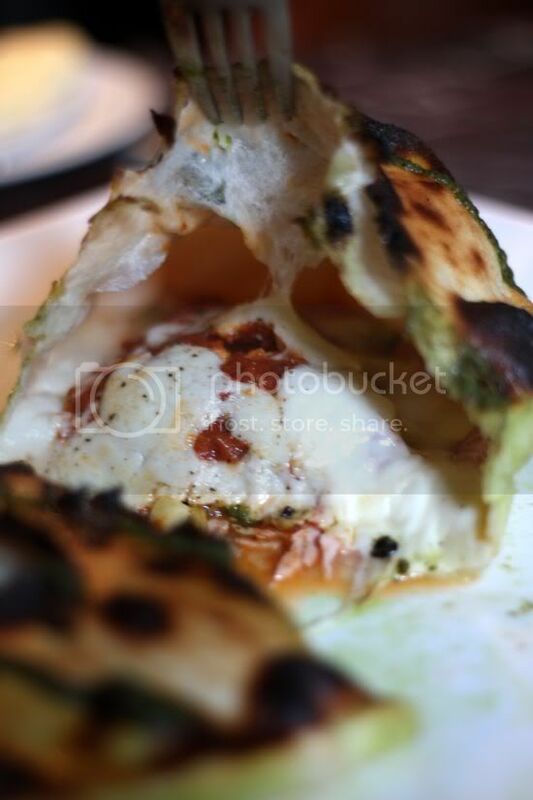 - salmon pieces draped around the poached egg with a surprise find in the form of an artichoke shaped like a bowl. 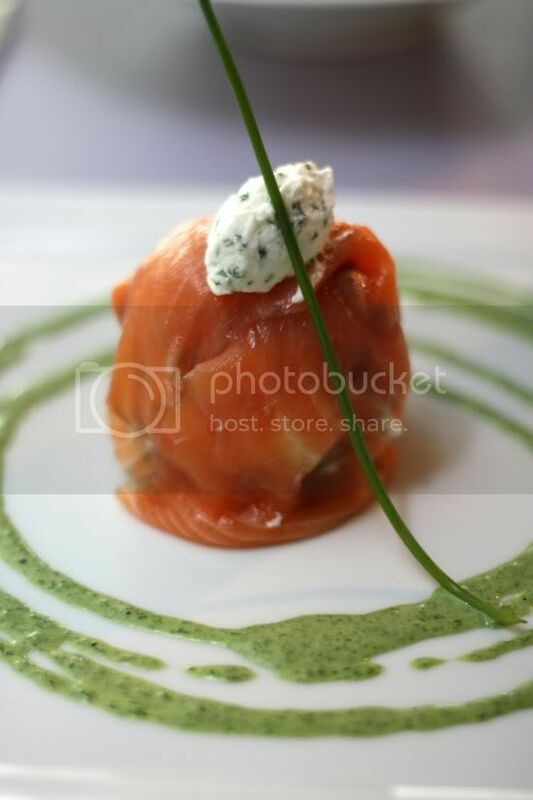 A quenelle of herby cream top my salmon cocooned egg . Break into it - mix the runny egg yolk with the creamy bit -it's a recipe for messy but an oh-so-yummy! appetiser that whets your appetite for more. Even the porcini mushroom soup was a comfort for the soul. Thick and rich in consistency, it seemed to resemble a rich sauce that was lightened by its foamy top and a perfectly grilled scallop. 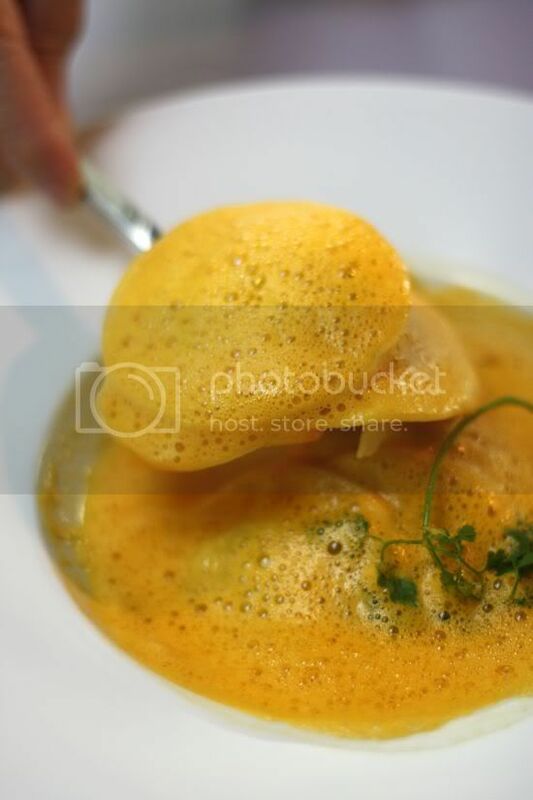 The only failure I reckon was the flavours for the ricotta herb raviolis as the sweet carrot puree hidden underneath my raviolis didn't kinda meld with me. Somehow the ginger aroma was lacking as that would have been a welcome relief from all that natural sweetness. 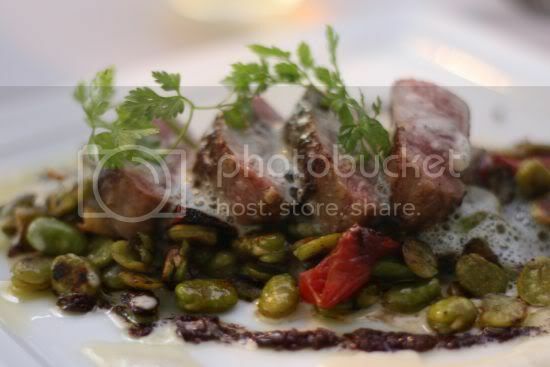 It was made up by the excellent cooked lamb loin - pink in the inside and served on top of these can't-stop-eating fava beans and a frothy goat cheese foam. 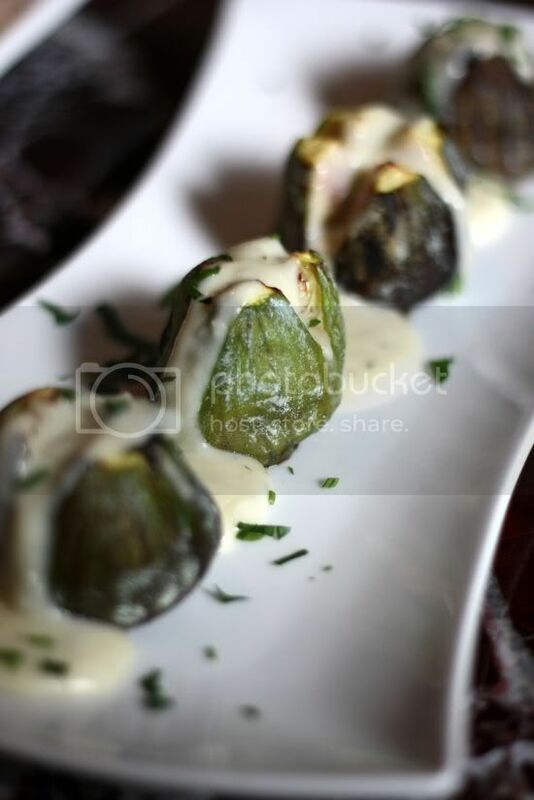 We especially enjoyed the slices of artichoke hidden within the beans that were also pan fried to perfection. 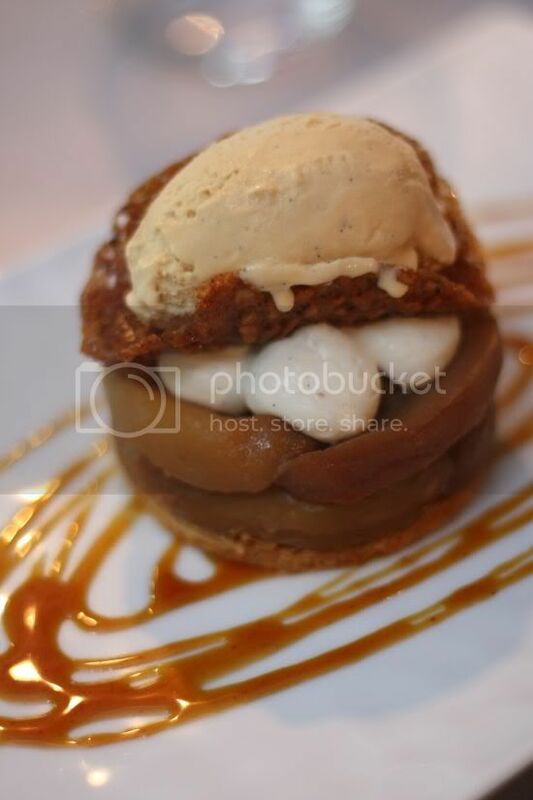 For desserts it was the revised apple tarte tatin - a take on the classic French version - stewed apple pieces, piped cream topped with a nutty brittle cracker that nestled a scoop of caramel ice cream. 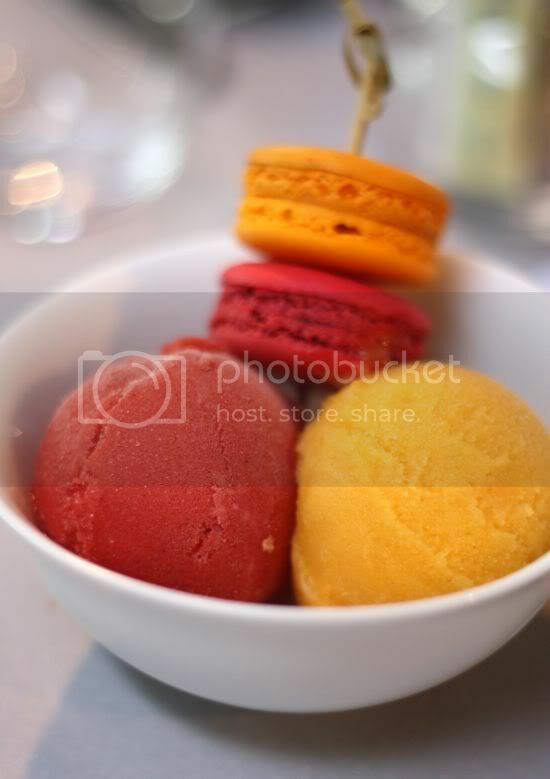 Another friend who is all for sorbets choose the macaron skewer and sorbet selection. Taste wise, the passion fruit sorbet won us over with its tangy refreshing flavour. It's the last week for this menu so drop by to get a taste of this menu. As a bonus, Nathalie's is also opened on 30 July for dinner. I also heard from a little bird that August's menu is even better, so I shall wait with bated breath for that affirmation. No matter how many times I indulge in the guilty pleasures such as foie gras, oysters or sea urchin, I still crave for good honest Chinese cooking offered by no frill places such as this restaurant. Discovered by my mother who in turn was brought here by her friends, I've been eyeing this place for quite some time. It fascinated me purely because I could see how packed it got every night whenever I drove past. 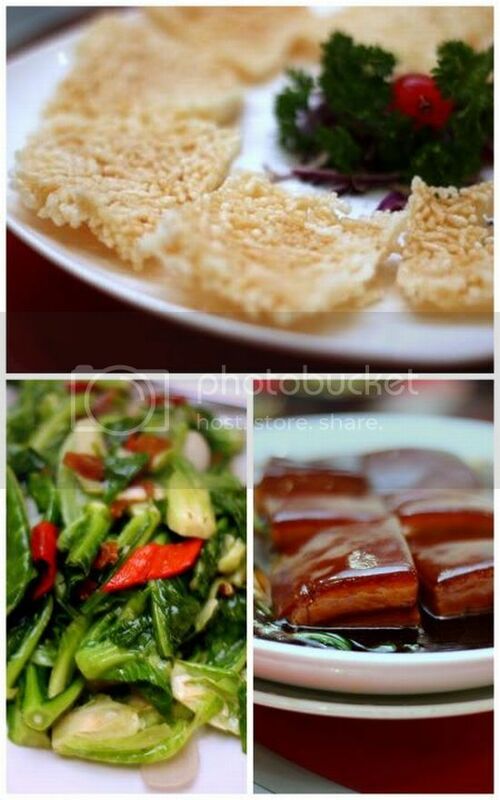 The food has a Hakka slant to it but adapted to the family who runs this place. 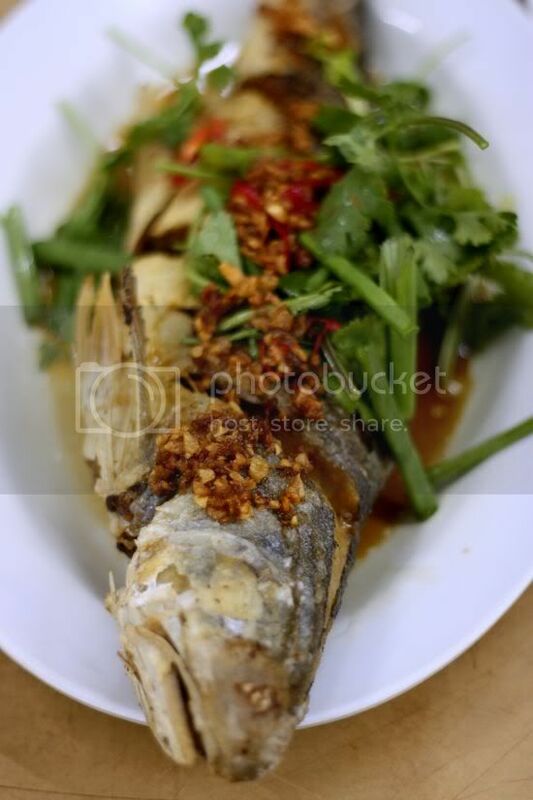 For instance, instead of the traditional Hakka yong tau foo stuffed with a paste made from fish, pork and bits of salted fish, here it is just pure fish paste. 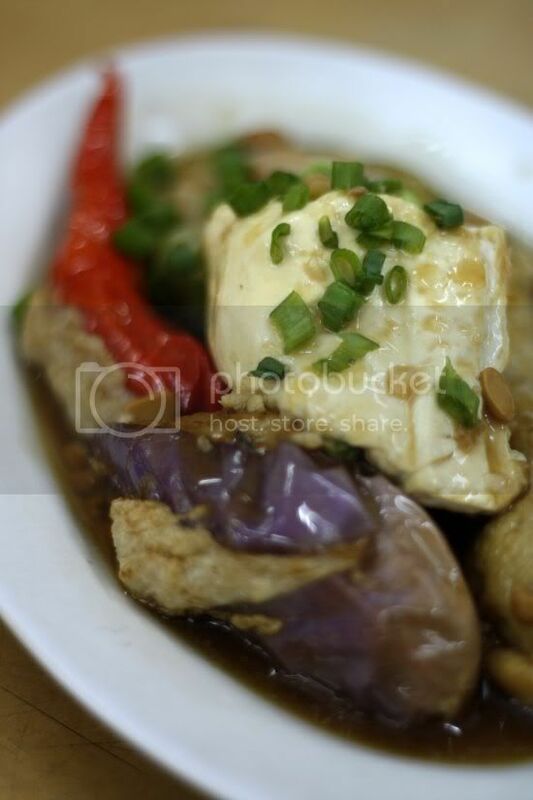 There is a certain earthiness to the hearty portions of vegetables and tofu stuffed with the springy fish paste especially with its simple homemade soy bean sauce. 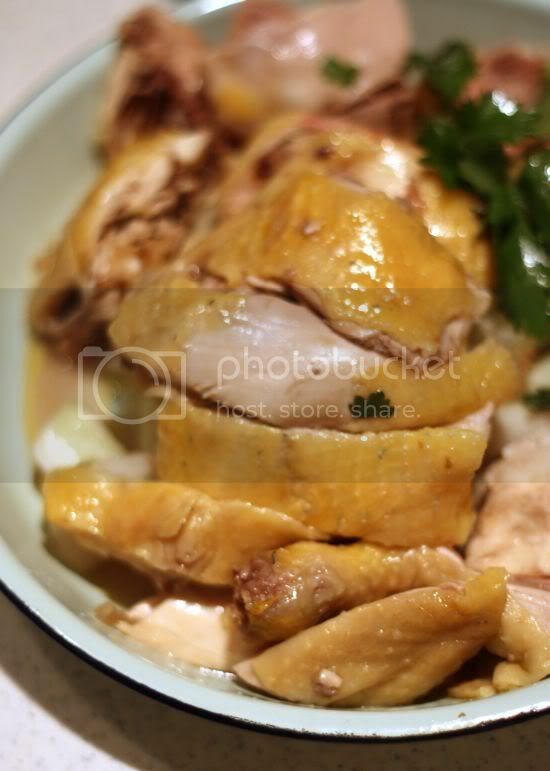 A favourite of ours is the yellow rice wine chicken that comes in a thick rich tasting sauce. Laden with ginger shreds, kei chi and just cooked chicken pieces, this version also includes a fluffy fried omelette that complements the tummy tickling broth best eaten with a big bowl of white rice. 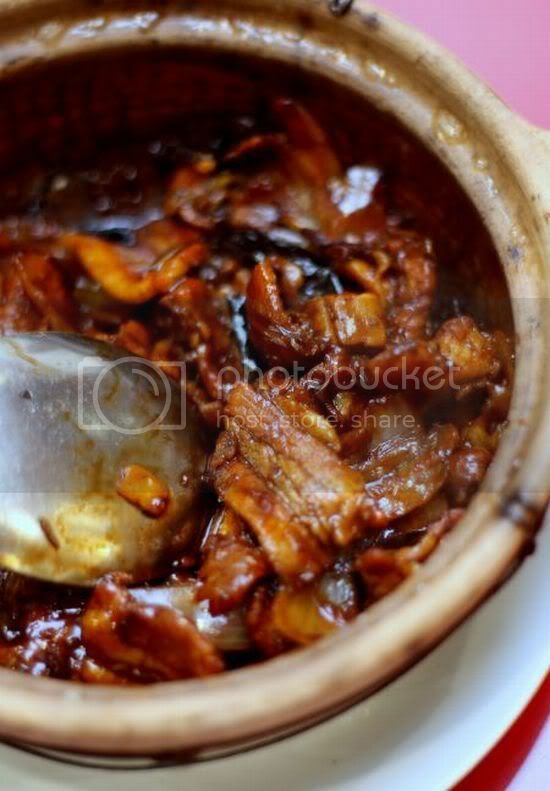 Another item that needs loads of carbs to complement it is the pork vinegar trotters - a concoction that is less sweet and not so sticky but with just the right amount of vinegar to make you crave for another spoonful. We especially liked the meat - fatty bits mixed with ligaments and meat - making it a very substantial meal. fried yau mak with "wok hei"
Even the humble fried vegetables gets a special touch here....literally the breath of the wok that infuses it with such a wonderful flavour that one piece is not enough. 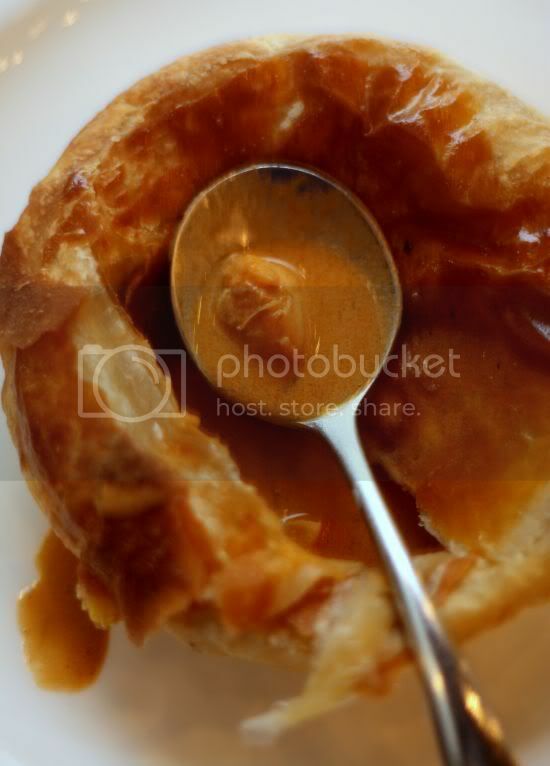 Savour it when it is piping hot. 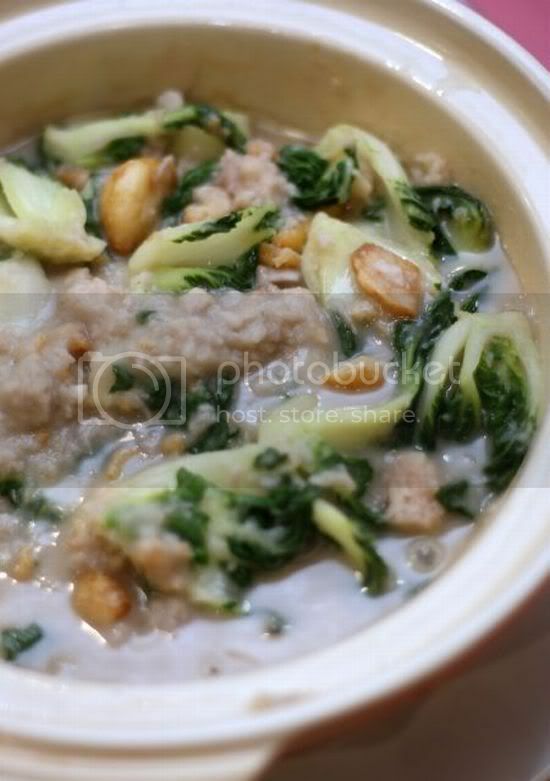 Another item highly regarded here is their boiled kampung chicken (choy yin kai) - smooth meaty pieces that are a far cry from the mushy texture of battery raised chooks. 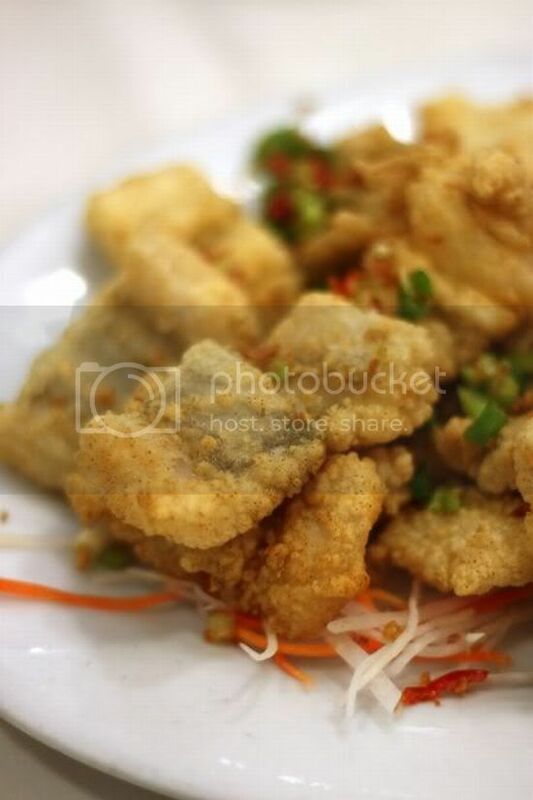 We also tried their deep fried ma yau fish, another home-like yet simple dish that was tummy satisfying. 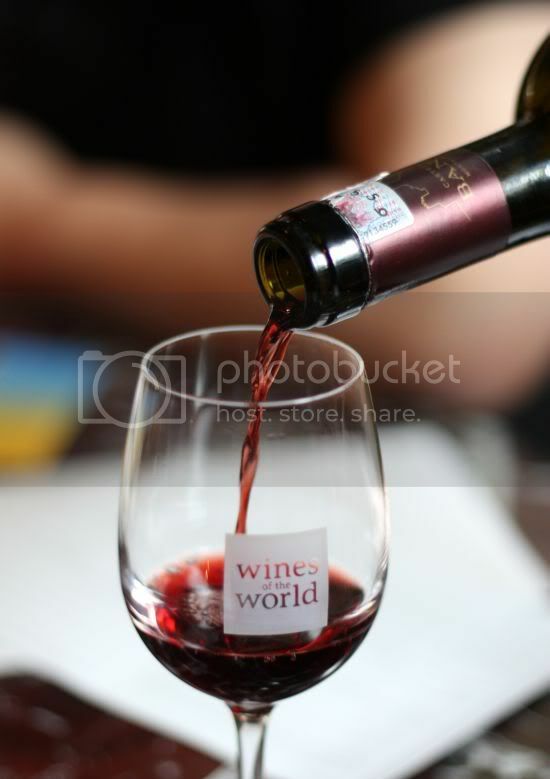 Recently, the restaurant expanded to Damansara Uptown, opening up for business on 28 June. I understand the owners closed this restaurant for one week so their chefs can show the branch's chefs the ropes. While the Damansara outlet is probably nearer, I reckon this place is still the one to visit since the original chef is still helming the kitchen. inspired by Teresa Teng's popular song, "Moon Represents My Heart"
I'm getting an early start on mooncakes this year round especially since the hotels and shops have started selling them already. My gut feeling that this early start for the festivities is somewhat tied with the declining economy (mooncakes has always been traditionally a great profit earner). Things are definitely not looking rosy, as I was down town last Saturday and it felt more like a ghost town rather than a bustling city centre. From what I understand, this is partly due to the closure of Puduraya for renovations and also in reaction to the petrol hike. Nevertheless, it was still an eerie feeling with empty streets that reminded me more of the Chinese New Year exodus. 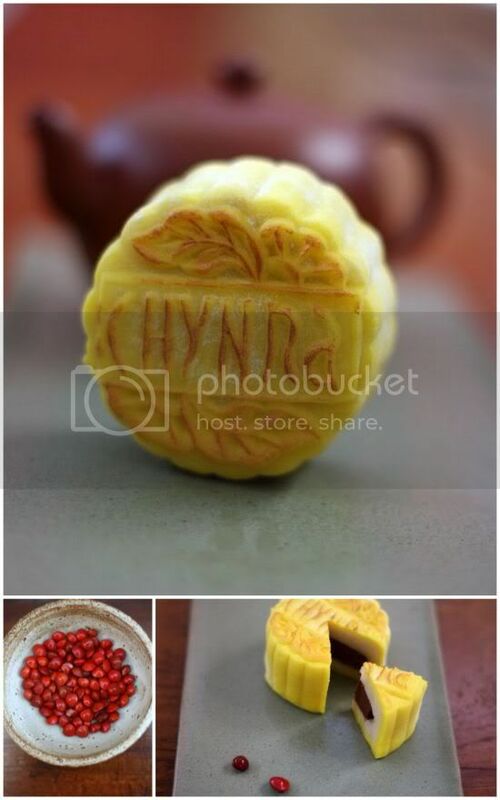 On to this year's offering from Hilton Kuala Lumpur's Chynna, a pale yellow snowskin mooncake called Yellow Moon. Every year, the restaurant offers unique pairings for their snowskin mooncakes - a little alcohol and a Western twist to the Eastern favourite. 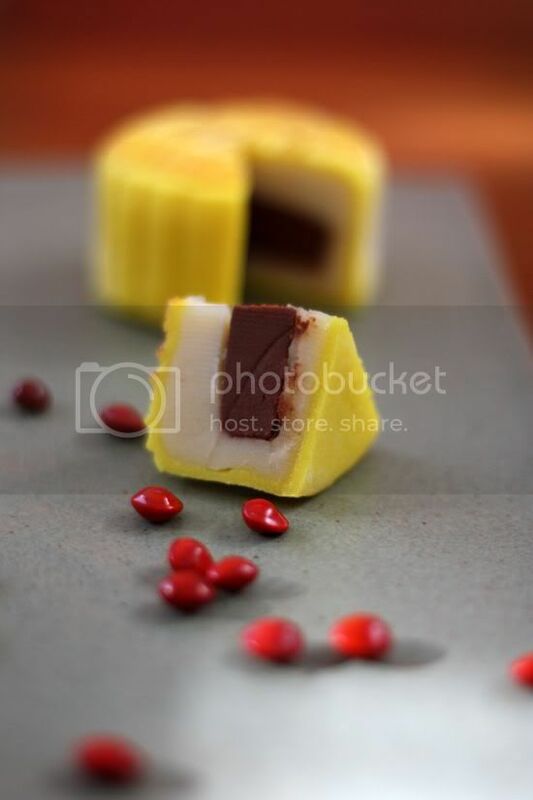 This year, the Yellow Moon is a snowskin mooncake that is wrapped around a Martell brandy flavoured lotus paste with a violet flower essence and Martell brandy chocolate center. The top of the pale yellow snowskin has a light gold dusting. While the flavours (violet and brandy) are not very evident, I loved the silky smooth texture of the whole ensemble including the chocolate, something that can tend to be hard vs smooth. 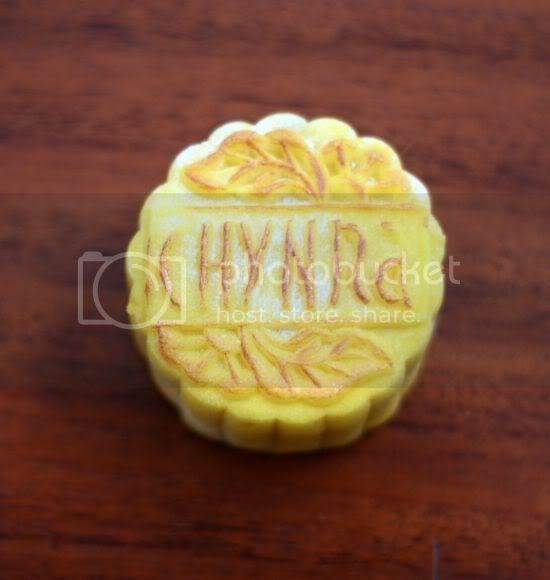 My memories of last year's mooncakes from Chynna are a little hazy but I didn't enjoy them as much as this one. Maybe it could be that this one is super fresh or they have tweaked their formula. They are still selling the previous year's varieties - the Red Lantern that I felt was too cloying, the Blue Moon, the Baileys snow skin but not the golden Tiramisu one. Prices have definitely gone up as now (my old worksheet says it was RM13.65 with taxes last year), the Yellow Moon is RM16++ and the other varieties are RM15++. This year's box (when you buy loads) is in the form of nifty looking wooden shelves that can act as a stationery supply box once you're done with the mooncakes. The Yellow Moon is inspired by Teresa Teng's "Moon Represents My Heart" song, which is also the title of Hilton Kuala Lumpur's Dama Orchestra concert. The concert will be held on 20 and 21 September (21 Sept is sold out) to commemorate the 15th anniversary of the late Teresa Teng. If you want to get the recipe for the mooncake, the Chynna Restaurant shares it in their F&B guide booklet and they even play a video of the dim sum chef making the mooncakes at the lobby where they sell the mooncakes. It'll be interesting to check out the other flavours in town. One evident trend that I'm seeing for the mooncakes is the use of black charcoal powder in the baked variety. I'm curious to try that to determine how it affects the texture of the skin or whether it is just a cosmetic or visual change. Wait and see as I'll try and find the answer to my queries. I reckon I've been blogging too much about Chinese food so here's something a little different to sink your teeth into....the incredibly fantastic Blackmore Wagyu beef. Named after the owners, this is prized by many as the finest beef and is served in reputable places such as The French Laundry in the US, Iggy's in Singapore and Rockpool in Melbourne. 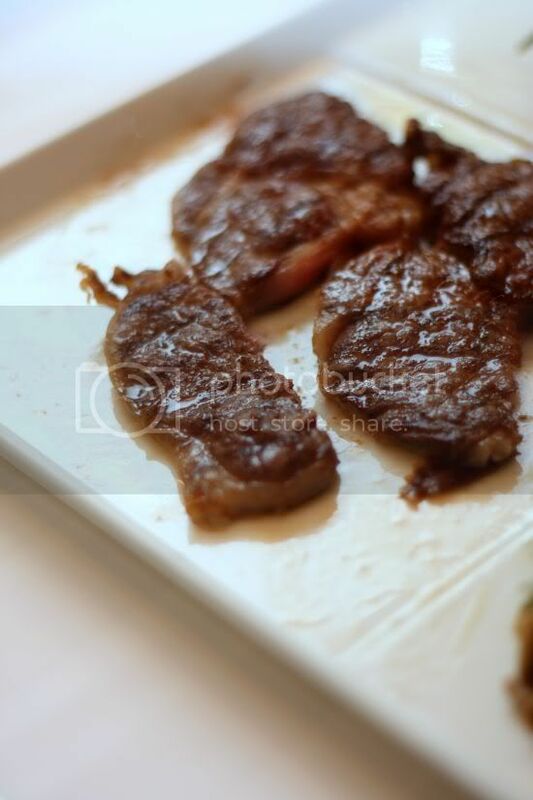 Rather than jet set to these places, we now have the opportunity to taste this butter-like beef as it is now available (a limited period from July till end of August 2010) for the first time ever at Prime, Le Meridien Kuala Lumpur. Le Meridien Kuala Lumpur's affable and Spain-loving Chef Anton has devised interesting ways to serve the meat. 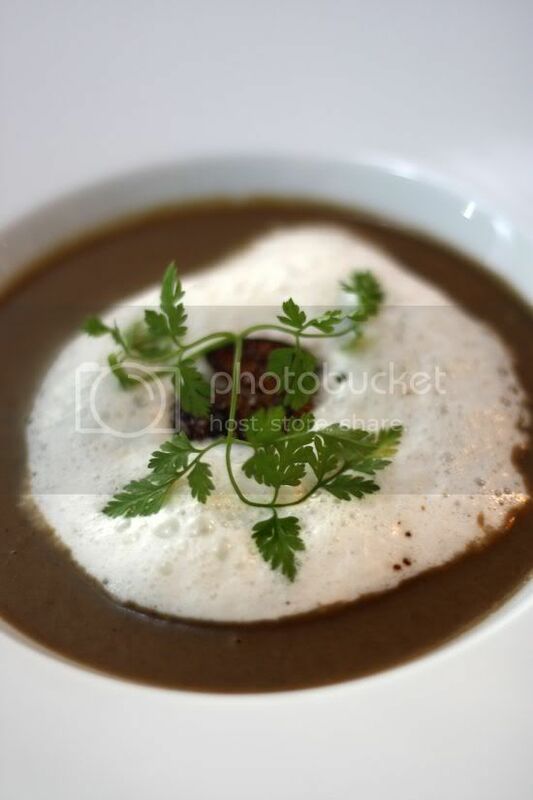 My favourite is the appetizer of 80g wafer thin slices of Blackmore Wagyu beef oyster blade served with a double beef consomme flavoured with Asian spices and sesame sauce (RM60++). 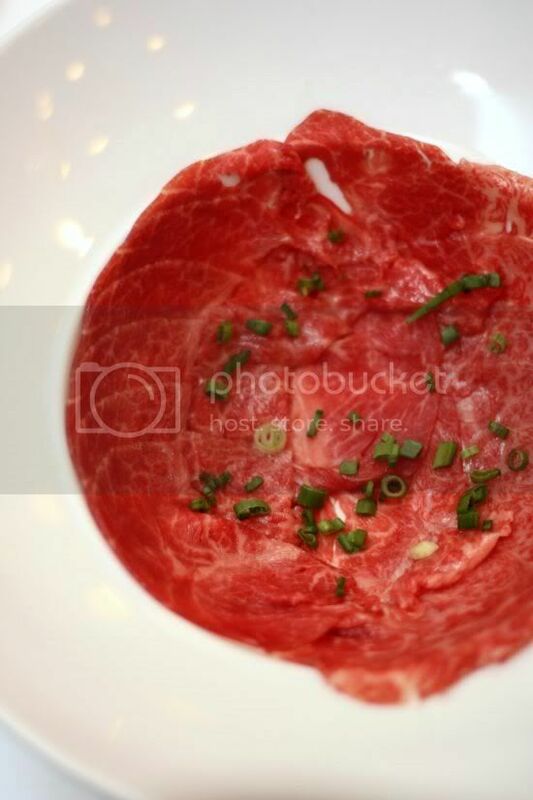 It is a visual feast as nothing is more stunning than the ruby red and white marbling of the beef laid out in a deep white bowl. Consomme is poured into this bowl from a teapot, which gently cooks the beef slices. On the side, somen noodles, tofu cubes and honshimeji mushrooms are laid out for you to add into the soup. A ponzu sauce is also available for you to dip your meat or noodles to get a tingle of tanginess on the tongue. 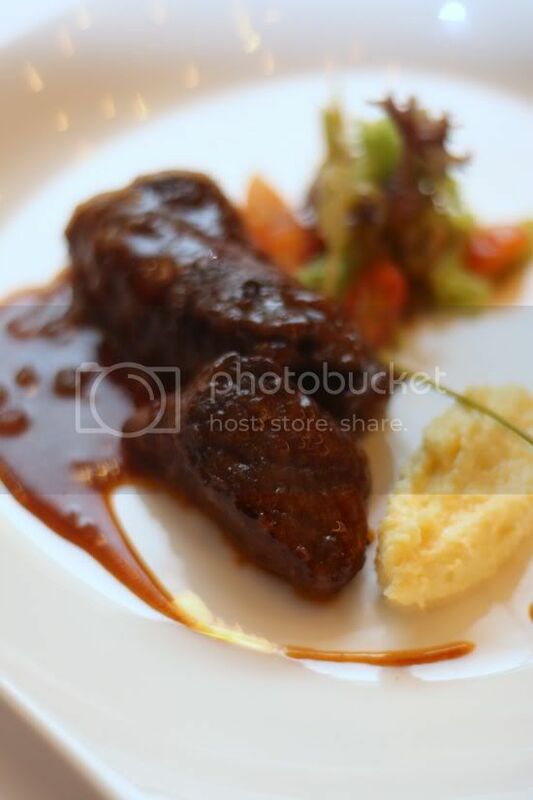 Only two appetizers are offered in this special menu, the other one item being the Inter Costal 140g Blackmore Wagyu beef braised in low heat and served with a homemade BBQ sauce (RM58++) - a thicker slice with a lovely soft texture. 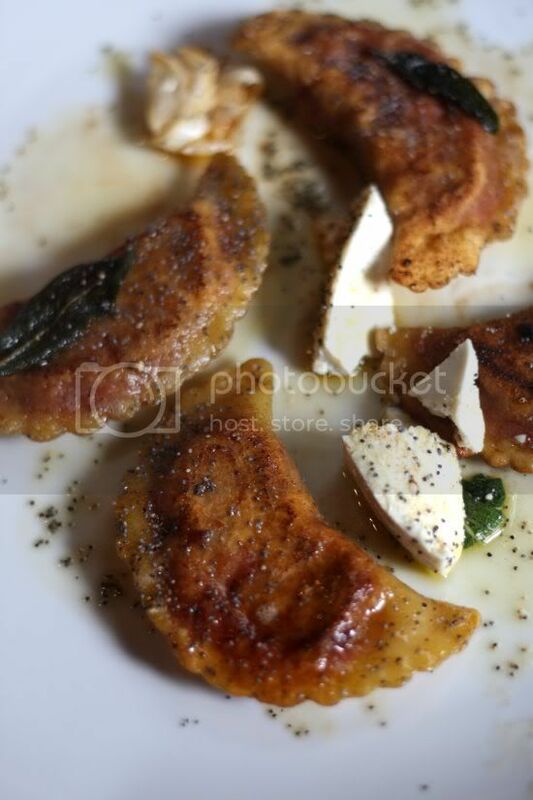 This is served with soft mascarpone polenta with truffle oil. 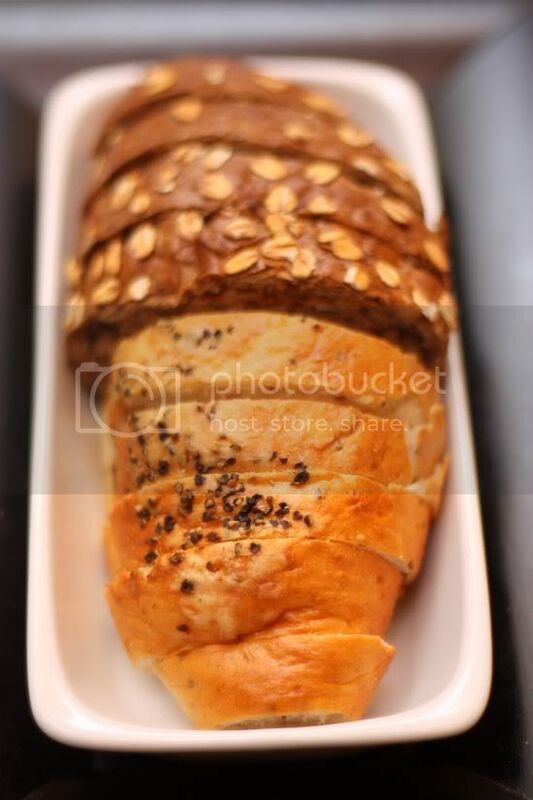 Make room in the tummy also for their superb bread. They're always changing the types served here and this time round, we sampled the walnut bread and a pepper crusted Emmental cheese bread. It's simply divine that I couldn't stop eating and slathering my bread slices with the divine Echire butter in 3 flavours: plain, pepper and rocket. 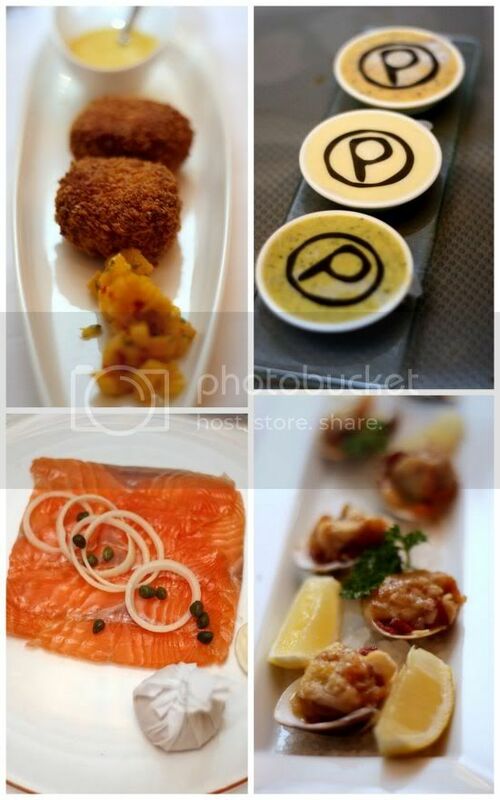 If you prefer, they also serve an array of superb appetizers ranging from the comforting creamy golden lobster bisque (RM45++) served with a puff pastry top, the apple wood smoked Norwegian salmon (RM45++) that is made in house or the Sabah clams Kilpatrick (RM45++), which is toped with smoked beef bacon, diced Roma tomatoes, tabasco and worchestershire sauces and the Australian crab cakes with chili flakes, garlic sauce and mango salsa (RM55++). The halal certified Blackmore Wagyu beef is reared in Australia but bred with Japanese wagyu beef genetics - a unique combination that produces a grade 9+ marbling. It is grain fed for 500 to 600 days. During the promotion, a Blackmore Wagyu beef set is also available - a choice of one of the appetizers, Blackmore Wagyu cube roll and dessert of fresh wild berries, whipped cream and Evian water for RM528++ for one person. The Blackmore Wagyu cube roll is available on an a la carte basis @ 170g for RM488++ and is served with grilled Mediterranean vegetables, a Charon sauce and truffle mash potatoes. The meat is superb with a buttery-like texture that you can probably use a butter knife to cut through it. On the side, there are a range of homemade mustards - grainy mustard, basil and orange marmalade mustard and fresh horseradish with grainy mustard chantilly. If you prefer to have something else, give a try to the Wagyu Prime Rib served with Idaho steak fries, wild forest mushroom fricassee and a light black summer truffle jus (2 persons for RM480). We had that the last time we dined here and was blown away by the beefy taste and portions. 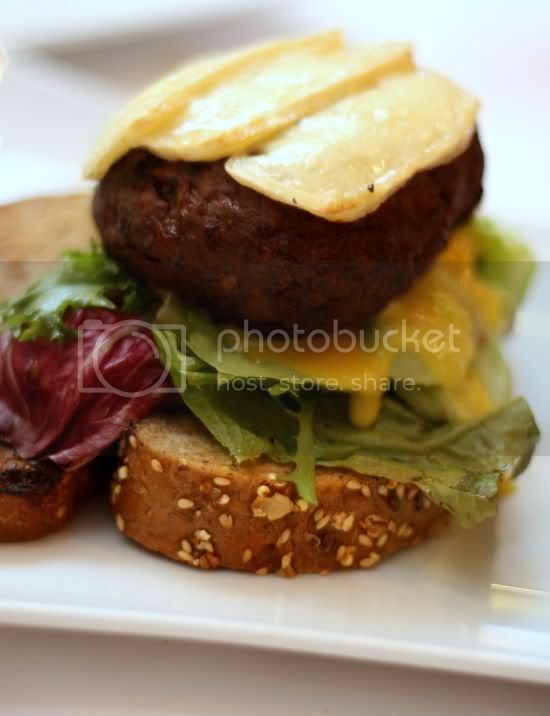 Alternatively, there is also Prime's unique take on a Wagyu burger (220g for RM105) - all home - served instead with a grilled French village country bread with Echire butter, a slice of Brie cheese. On the side, guacamole salsa, homemade truffle ketchup, thick cut fries are served. 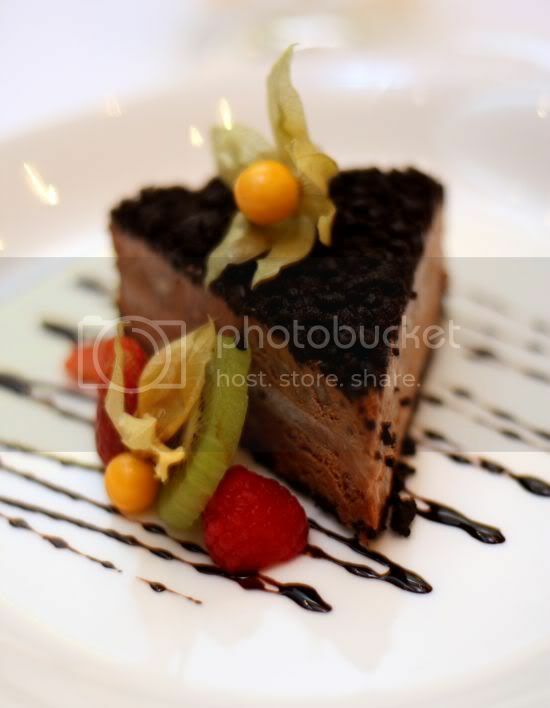 Don't forget desserts as they do a wickedly good pecan mud pie with chocolate sauce (RM30). The last time we were dining here, it was Splashie Boy's impromtu birthday cake. I love how the flavours all meld together with the chopped pecans within and the biscuit crust. 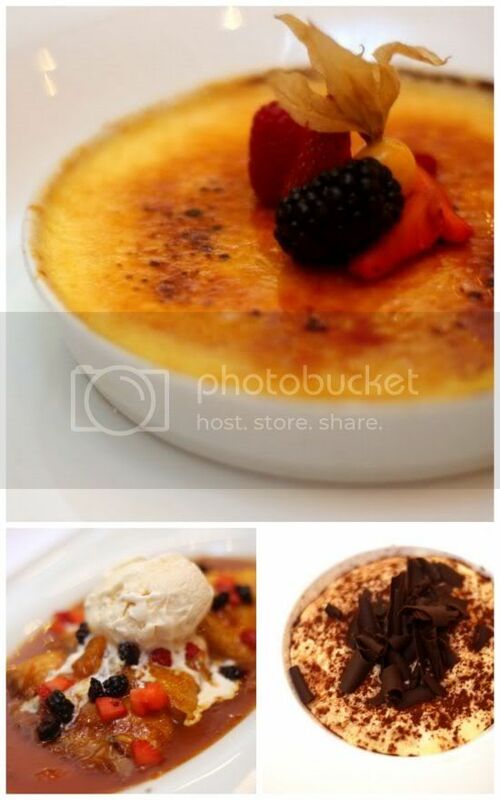 We also sampled the creme brulee made from creamy Tahitian vanilla beans and served with fresh seasonal berries (RM25). The fruits can be a little tangy that helps cut through the rich tasting creme brulee. The all-time favourite of tiramisu (RM30) is made with an Illy coffee soaked sponge and topped with a foamy mascarpone cream - reminds me of the Favola version minus the pop rocks. If you love a tangy taste, the crepe suzette (RM30) with the preserved orange zest and vanilla ice cream will knock your socks off with the strong flavours. Pair everything off with good friends from nearby and far (from New York), a few glasses of wine and you will have a recipe for a successful dinner. I reckon we'll be doing another visit soon as I'm going to drag the beef-loving Splashie Boy to try the divine melt-in-the-mouth Blackmore Wagyu beef. It's a once in a lifetime chance for any beef lover, so do grab this opportunity during this promotion. One is still tweaking the design - cutting back on the colour and making it more "clean cut" for the pictures and the text to be easily seen. I've also geotagged a few of the recent blog posts so just click on the link below it and it'll open up to the location map. Very much WIP so please bear with me? Anyway, back to the very overdue Hong Kong posts. This particular one, I remember with a heart (or more likely a tummy) ache as the food was so incredibly good and introduced by my guide, J from Elegant Inn. 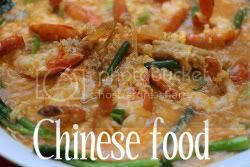 Hong Kong's Teochew or Chiu Chow food is so much better than the fare we have here plus they also have a variety of old style dishes not commonly found in restaurants nowadays. Everything I tasted at this famous eatery was top notch even though it was very simple fare. Frequented by many including the well heeled (in Hong Kong, these are the ones that come in their luxury cars as they line the road in front of the restaurant), this place is also nicknamed the "rich man's canteen". The eatery is spread around a few shophouses along the street and booking especially during the weekends is a must or else, forget dining here. 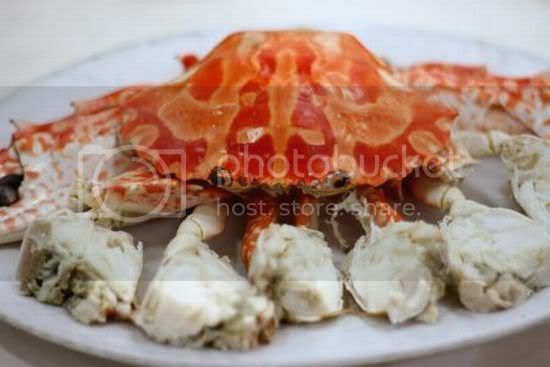 We start off with the cold flower crab, a Chiu Chow specialty and a simple dish, which allows you to enjoy the sweet taste of the crabs. The meat is so fresh that it comes out in beautiful chunks - literally a crab-lover's heaven to eat. How I wish more places do this cold crab dish here. 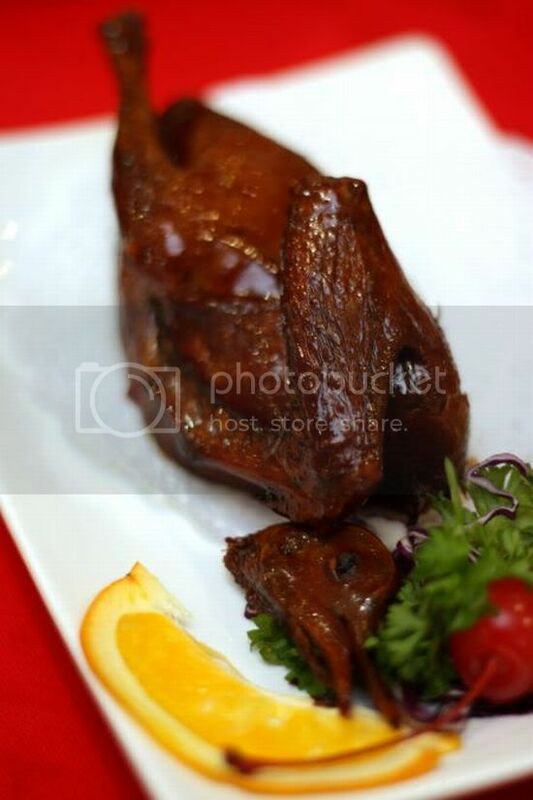 Braised duck is a must here but in Hong Kong, it is a little special as its braised goose. 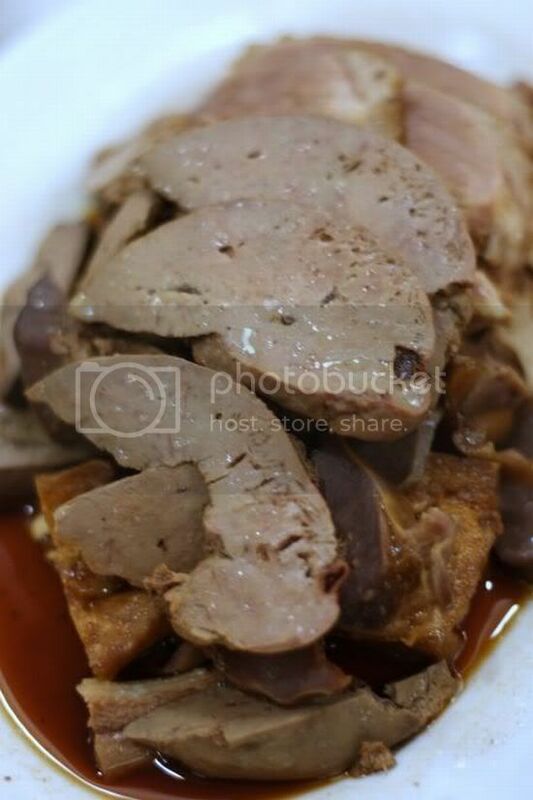 Our dish of braised goose slices come topped with decadent thick slices of goose liver. Yummy to the last tenny weeny bit (even though one can feel the arteries clogging up!). Even a simple tofu dish tastes awesome here - puffed into golden ingots that you dip into a salty spring onion dip to give it flavour. I couldn't resist the chicken dish - boneless pieces pan fried in a delectable sauce served on a bed of crunchy fried leaves (I think they look like mulberry ones?). As usual, there'll be oysters lurking around a Teochew meal and here they are served in two ways - first in a soupy (another rare one here for me even though I've eaten this before in Kelantan and Melaka) kind of porridge where cooked rice grains are used and cooked with spring onions, minced pork, preserved radish and sliced mushrooms. Incredibly comforting for the tummy. 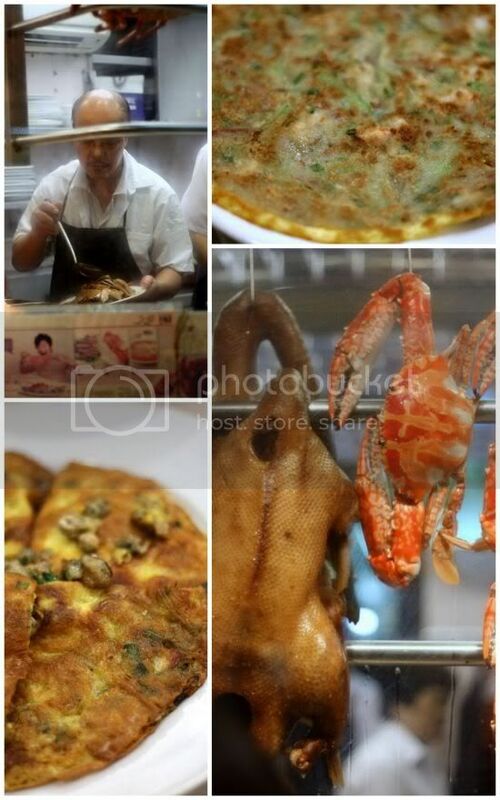 The second way was the oyster omelette or o chien style. Here it is wetter and less crispy, where the oysters are hidden underneath an innocent looking omelette. 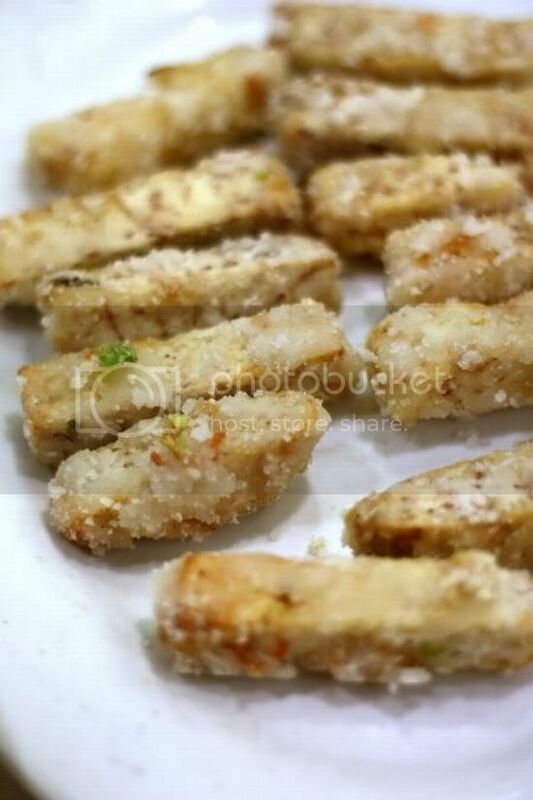 We also have a flatter and chewier version but with prawns and a type of green colour gourd. Last but not least, desserts that is a must for any Teochew place. 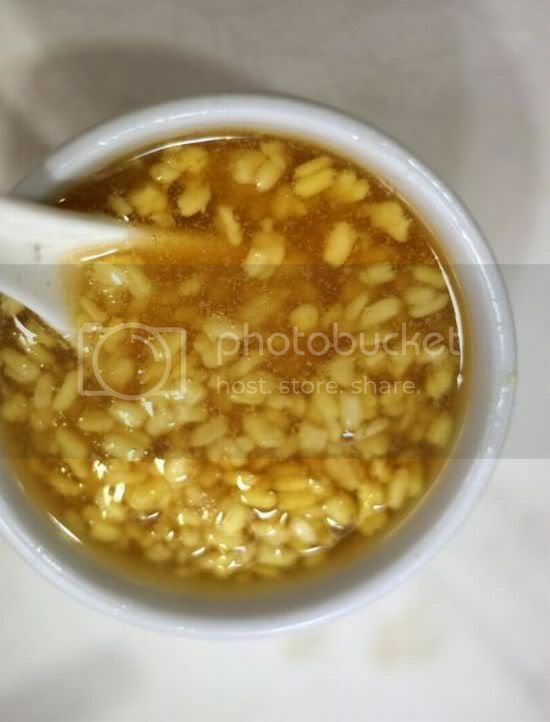 They had the very rarely seen Tau Suan - a dessert made with split green beans and of course, the ever famous yam dessert, Or Nee. 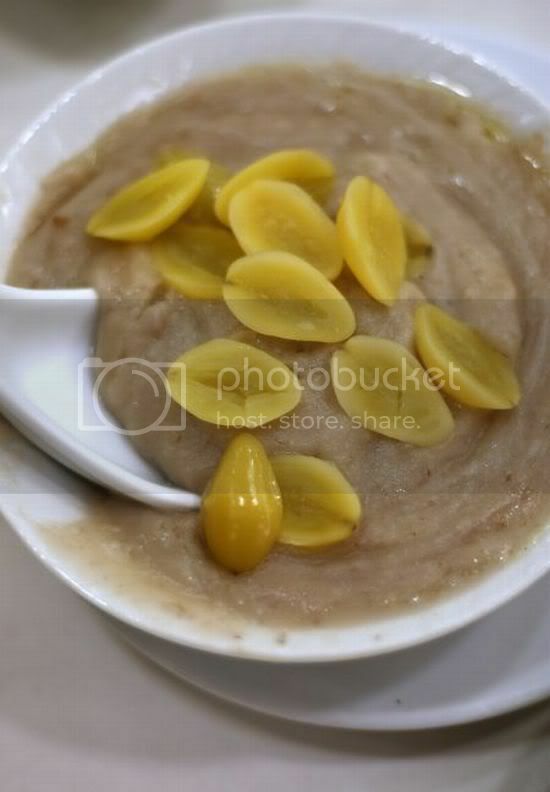 We had to wait for a while to get our desserts as there was a mix up in our orders but it was well worth it - fluffy yam paste with lard and topped with gingko nuts. I was also introduced to another dessert not usually seen here - deep fried yam pieces that are coated in a candy like sugar coating. Light fluffy yam is paired with a sweet coating that tasted so incredibly good that I had a few pieces. Do make it a point to drop by if you're in Hong Kong as its definitely great to taste these old styled dishes which are fast dissapearing from the menus. I'm in the midst of experimenting....with the blog design so bear with me as some changes are currently on the way. I may know a lot about food but when it comes to techinical things like blogs, codes, websites and etc, I'm a total dunce. 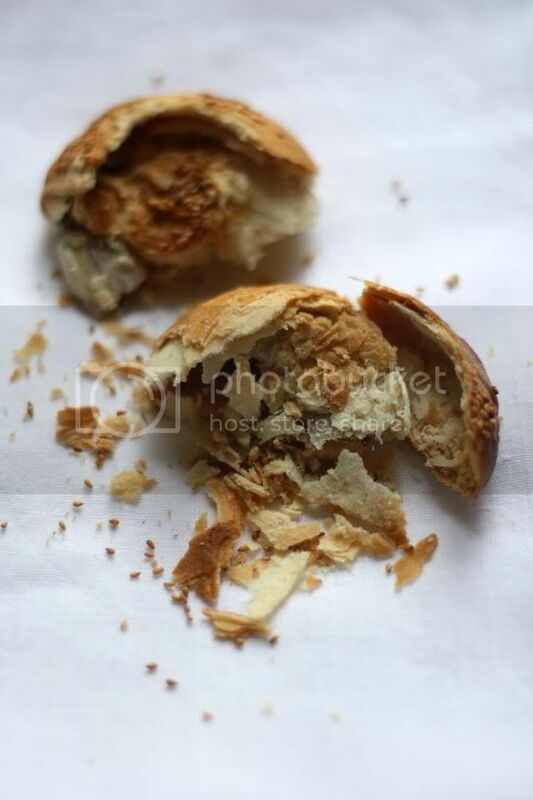 Here's a quick post for the Monday....an amazing biscuit I had recently fresh from Teluk Intan. As a family, we're quite blessed with friends who drop by with lots of good food. One such person is my sister's good friend who will always give us a fresh packet of these delectable morsels whenever her mother comes down from Teluk Intan. 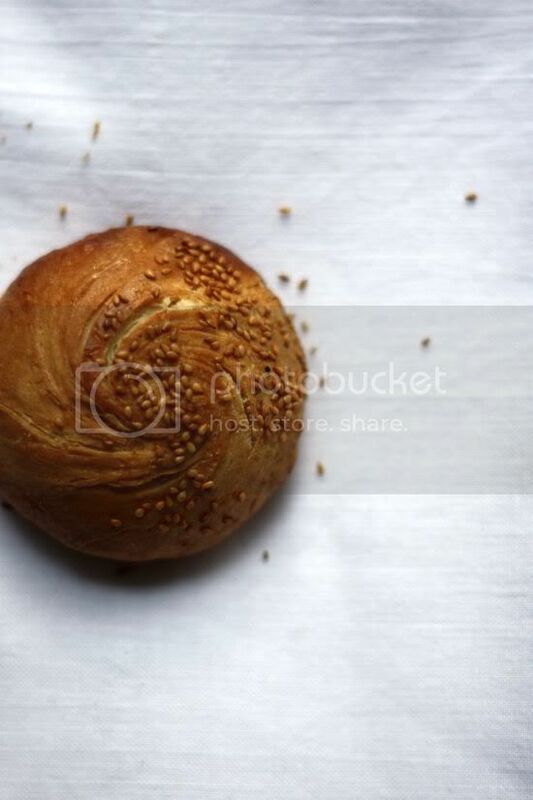 Super flaky, touched with sesame seeds that seems to add a certain oomph! to it all, and filled with a not overwhelmingly sweet caramel filling, this is by far my favourite biscuit from that "leaning tower" town. They don't last long in the house, as one biscuit is never enough. Just watch out as it can get quite messy (and you can't seem to stop eating them!). I reckon I'm a little selfish. Maybe on a subconcious level I think and not deliberately so - probably that is why it took me a little longer to share this place with all of you. However like all foodies, I believe in the philosophy that "sharing is caring". Taking a deep breath, here's the pick of the moment for my food-loving friends....drum roll please....an alternative for Sang Har Noodles aka those sinful freshwater prawn noodles in Petaling Jaya besides that place which starts with the letter "G". Literally a hop and skip away from that "G" labeled restaurant, Richwell's kitchen is under the care of Chef Kam who used to be in Teochew Restaurant in Pudu. From what I read from Foodbin who has visited this place before, the restaurant used to serve fusion food before it decided to focus on Chinese cuisine. 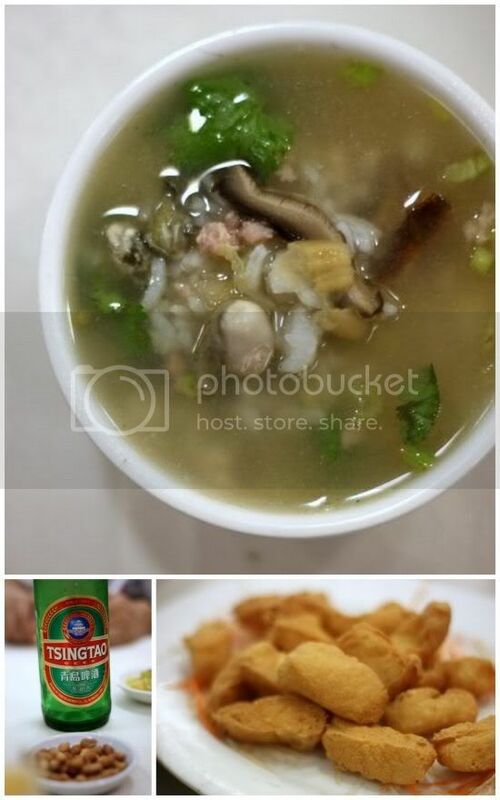 Being in the able hands of friends who had dined here earlier we zoomed in on the must-haves. First it was the roast pigeon (RM35 each) as an appetizer that we shared. No formalties here as we used our fingers to tear through the crisp skin rich with spices and a touch of rose wine to get to the lovely juicy meat within. It was yummy stuff that whetted our appetite for more. As usual, we had over-ordered to the horror of the chef - he even forbade us to order any rice. 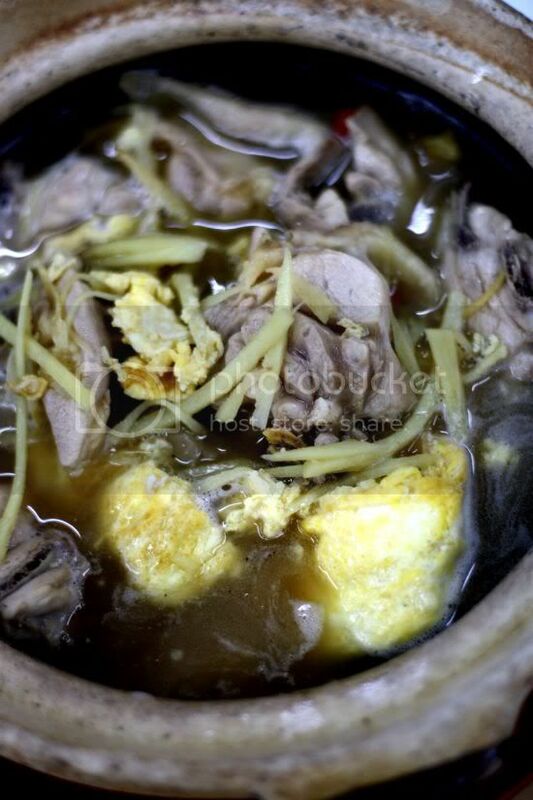 Our resolve crumbled like sand, the moment the smoking hot ham yue fah lam poh (salted fish belly pork in claypot, RM15) arrived on the table. 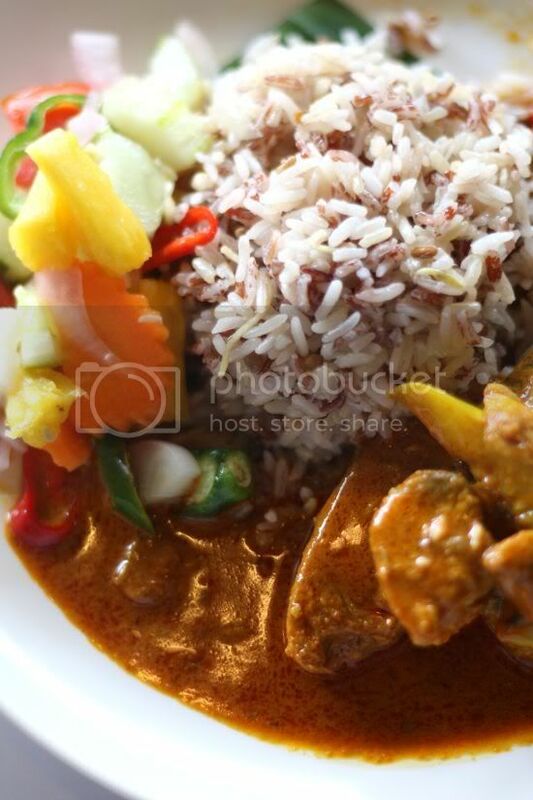 Who could resist those enticing flavours and a silky brown sauce that screamed for pure white rice to sully it! Break our rule we did but cautiously - rationing ourselves to one scoop of rice to relish that heavenly dish of tender pork belly slices coated in a rich tasting sauce peppered with dried chillies. Reeling a little from the fat overload, we were all relieved when a plate of greens arrived on the table. 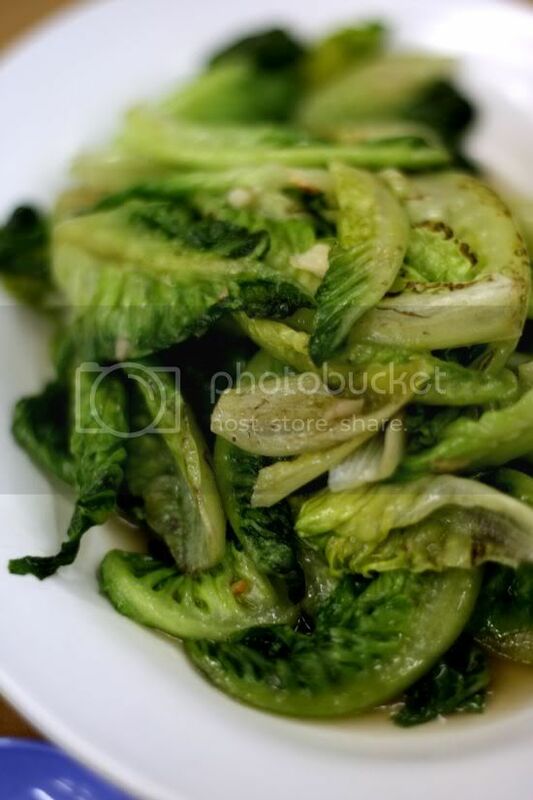 Forewarned ahead of the tanginess of the dish known as Thai styled fried pak choy (RM25 for a large portion), we all relished every green stalk mixed with chopped onions and chillies anointed with lemon juice as it inadvertently became a palate cleanser for all of us. 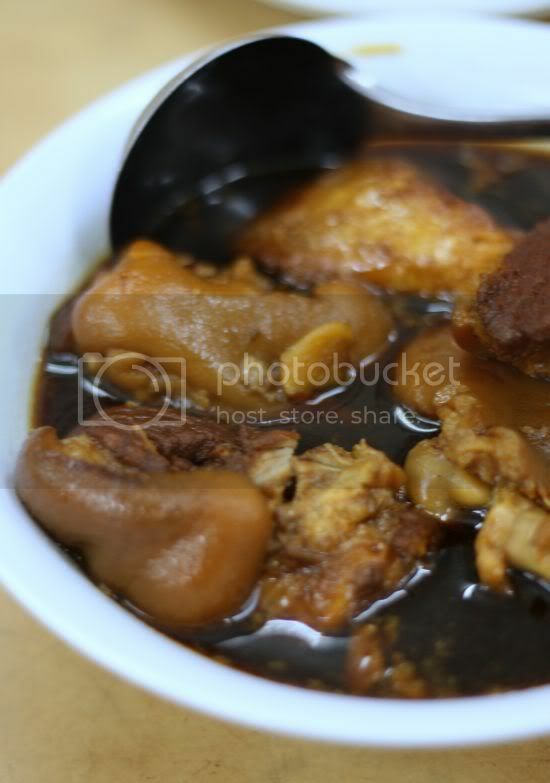 Once we had crunched down that healthy dose, we were all ready for an even larger dose of fats in the form of the Tung Por Yoke (RM40) - fatty slices of meat doused in a glistening thick brown sauce. While mantou is commonly offered here, my friends insisted on the fried rice crusts (RM3), a nice textural contrast especially when the sauce soaks into the crust. 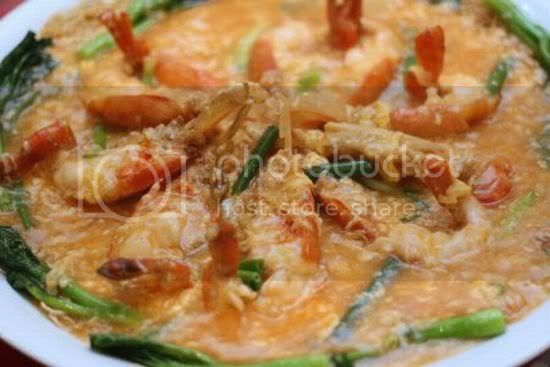 The dishes kept rolling in, including their signature Sang Har noodles (RM100) - a medley of thin egg noodles drenched in an orange eggy sauce with halved freshwater prawns. While the prawns weren't the super gigantic ones usually served, we enjoyed every bit of the sweet crustaceans and the noodles that soaked up the gravy that we could have licked the plate clean. Yums indeed! With our tummies groaning, it was almost the last leg of the race - the New Zealand baked rack of lamb (RM15 each portion). While the meat was tender (a little too tender in fact that we think it had too much of an artificial help), it was the wonderful sauce that coated it that made the dish unforgettable. Another finger licking good dish. 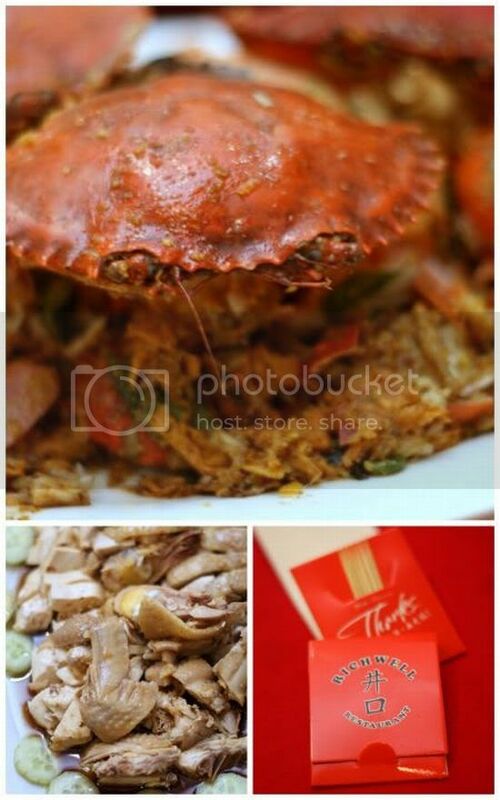 Hurray, we made it to the last lap - the claypot crab with tung hoon (RM70). Slightly peppery, the noodles and crab were so good we pushed ahead and almost finished everything. After that feat, it was another repeat performance the next night but thankfully on a smaller scale. This time it was a mixed bag - repeats of favourite items from the night before with the addition of new dishes. The kampung Hainanese chicken with rice (RM40 for a small portion, needs about 1-2 hours ahead of pre-ordering) was full of flavour especially the fluffy grains that were blessed with the chicken drippings. I loved the Teochew flavours in the claypot yam and lai pak (RM20 for a medium portion) - a wonderful combo of smooth mashed yam with vegetables. We also decided to try their salted egg yolk crab (RM60 for 3 crabs) - a little different than the normally wettish sauce made with margarine and crushed salted egg yolks, this one was fried till dry to form strands instead. There's not much of a salted egg yolk taste but the crabs are still tasty. 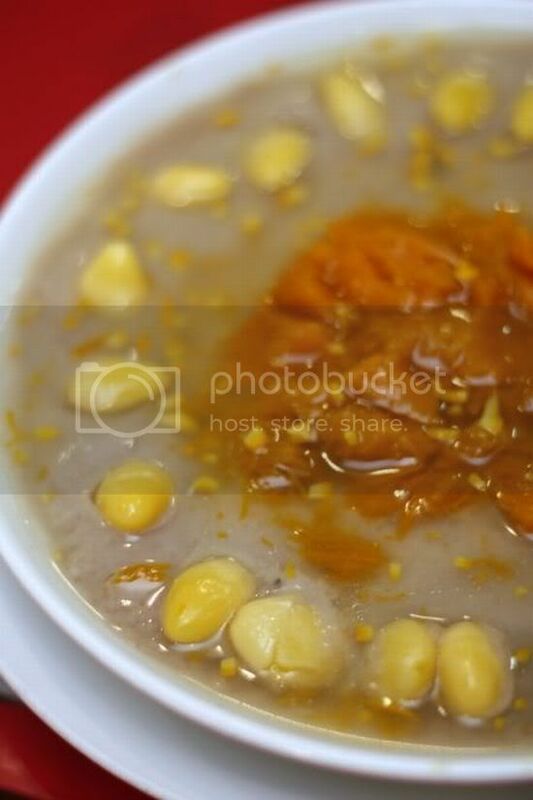 Last but not least finish off with the Or Nee (RM20) - another classic Teochew dessert. Here, this lard laden dessert is given a twist - sprinkled with chopped fresh orange peel that adds a tang and makes it only slightly less sinful. Return visit again - definitely so I reckon as we're all hooked on the food here. Parking can be quite a nightmare here though since it is limited but the restaurant has 3 reserved spaces in front of it.